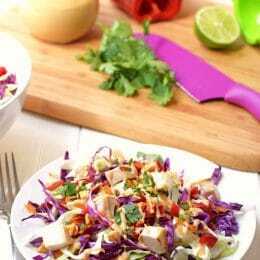 Rainbow Chicken Salad: Adults and kids will love this colorful, healthy salad! Made with fresh veggies and a delicious homemade peanut dressing. Hello! Tiffany from Feel Great in 8 here! I don’t know about you, but where I live January is cold and snowy and has me wishing for all things bright, colorful and fresh! 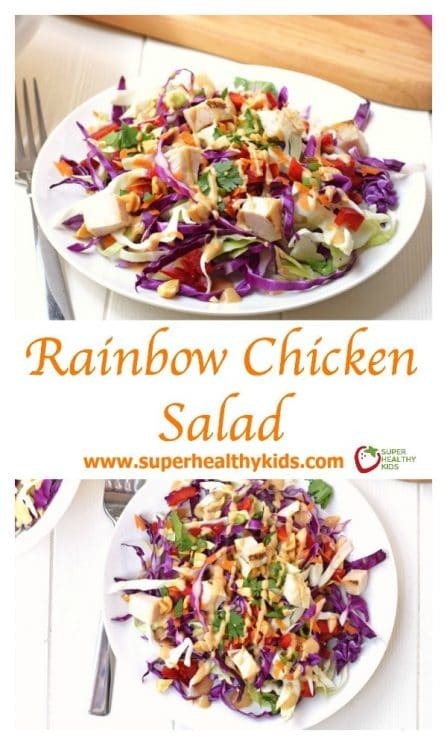 This rainbow chicken salad is the perfect fix and your kids will love helping you put together all the colors of the rainbow. Serve them in a wooden bowl to make the colors stand out! It is missing some blue/indigo veggies, but you could always serve a blueberry fruit salad for dessert. This is also a great chance to talk to kids about the amazing healthy benefits of eating lots of naturally colorful foods! 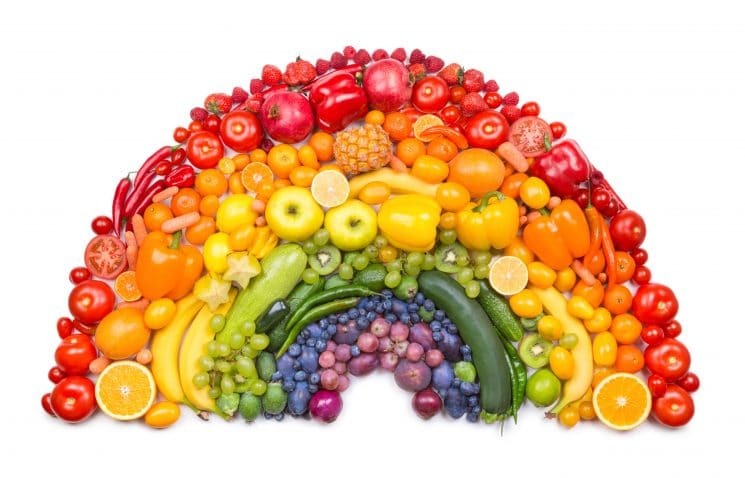 Red fruits and veggies act as powerful antioxidants and may help reduce cancer risk, red and yellow fruits and veggies are good for the eyes, heart and immune system, and purple fruits and veggies may help reduce the risk of stroke and heart disease. 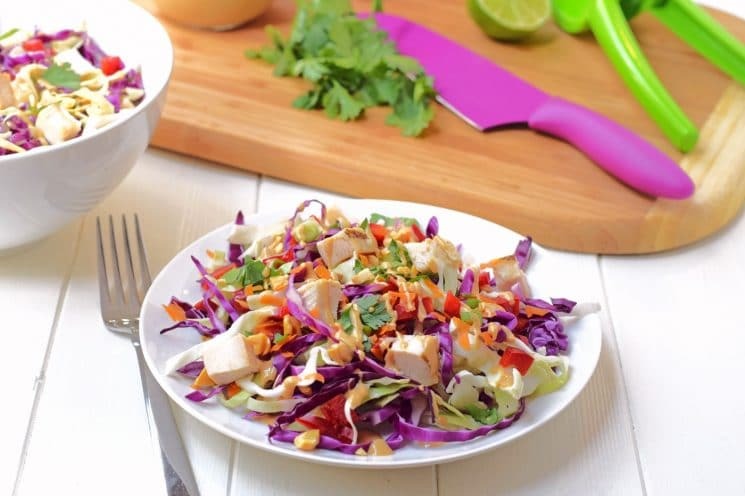 This rainbow chicken salad has them all! And, having them help put this delicious salad together means they are more likely to eat it too! My family devoured this one – even my picky toddler ate every colorful piece! I hope you and your family loves this one as much as we do! 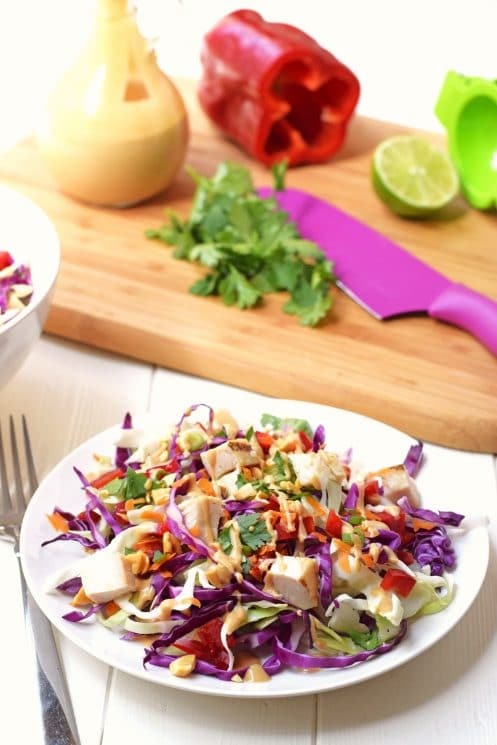 Looking for more healthy, fresh, delicious salads the whole family will love? Checkout these other yummy recipes from the Feel Great in 8 blog. Cook and dice chicken (3 cups cooked). 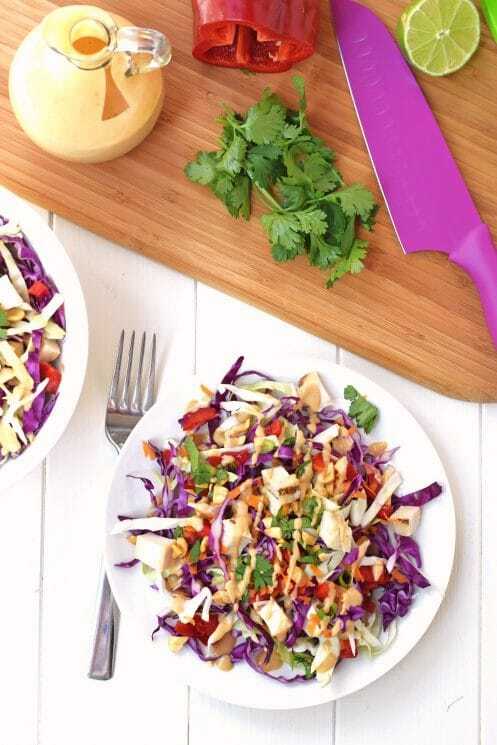 Shred cabbage, grate carrot, core and chop bell peppers, dice avocado, and chop cilantro, green onions, and peanuts. Have kids help add all of the prepared salad ingredients to a large bowl and toss well. Whisk together all of the dressing ingredients. If too thick, add hot water one teaspoon full at a time until you reach your desired consistency. Drizzle the dressing over the salad and toss. Serve immediately. Surprisingly the kids are this all up, and I was able to add a new salad to my list of faves. I used almonds and almond butter instead of peanuts. I also didn’t use any chicken for a more vegan friendly meal. I also switched out the soy sauce for liquid aminos. Great salad – I baked the chicken first in a garlic vinaigrette marinade with a little salt and pepper. I never use cilantro since no one in my family likes the taste. I couldn’t find and avocados or green cabbage – so I just used the red cabbage and I substituted guacamole. Also used chopped cashews instead of peanuts. Everything tasted great with these changes. It was great! We didn’t have lime so I used lemon, and I seasoned the chicken with garlic powder, salt & pepper. I also couldn’t find cabbage at Aldi so I used broccoli kale cabbage slaw they have mixed already.